Charles Riddle won a big early lottery in 1975. After getting divorced quickly and facing several lawsuits, he was arrested for selling cocaine. William “Bud” Post won $16.2 million in 1988. He was sued by a former girlfriend who wanted the money, and his brother hired a hit man, hoping to murder him and inherit it. He was $1 million in debt in a year and later went to jail for shooting a gun over a bill collector’s head. Post called winning the money a “nightmare.” He died in 2006 after declaring bankruptcy. Jeffrey Dampier won $20 million in 1996. Dampier bought homes for relatives. Several years later, a sister-in-law and her boyfriend kidnapped and murdered him for the money. Billie Bob Harrell, Jr. won $31 million in 1997. Harrell used the money to purchase a ranch, homes and cars for himself and family members. His spending and lending spiraled out of control. Harrell divorced, and just 20 months after winning the money, he committed suicide using a shotgun. Victoria Zell won $11 million in 2001. Zell landed in prison after a drug and alcohol-induced collision that paralyzed one person and killed another. Callie Rogers won $3 million in 2003. Sixteen-year-old Rogers spent the money on fancy cars, gifts, lavish vacations, and plastic surgery. An ex-boyfriend got her hooked on cocaine, a habit she spent hundreds of thousands of dollars on, and she attempted suicide twice. Abraham Shakespeare won $31 million in 2006. Shakespeare went missing in 2009 after spending most of the money. A few months later, his body was found under a slab of concrete. To put perspective on these stories, we should realize that many people dream of winning the lottery because they feel certain it would bring them lasting happiness. As long as they don’t win, hope remains. But once they do win and still don’t find happiness, their hope is gone. As a bumper sticker says, “The lottery is a tax on people who are bad at math.” The chances are greater of being struck by lightning than of winning a multimillion-dollar lottery. But even if someone ends up winning, the gambler has violated God’s means of provision. It’s hard and wise labor that brings financial profit (Proverbs 14:23). Even then, reality is that money and material possessions can never satisfy the deepest longings of our hearts. God is jealous of our affections, demanding that He alone be the focus of our worship (Exodus 20:3-5). Scripture tells us to put our hope in God (Psalm 42:5, 11). God tells us to work for a living, not play the odds and seek shortcuts to wealth (Proverbs 28:19-20). God is sufficient to supply all our needs (Philippians 4:19). Scripture warns us against covetousness (Deuteronomy 5:21) and calls us to contentment (Philippians 4:11-12). May we remember that ultimate satisfaction can only be found in God, the gracious giver of all good things. We were made for Him and we will never be satisfied with less. The above blog tells the sad stories of only a few winners. 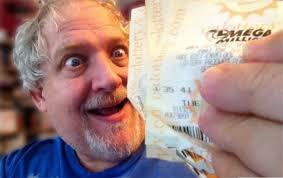 There have been thousands of big lottery winners, and, of course, many have not been ruined by it. But several studies have shown that a surprisingly high percentage of lottery winners do “pierce themselves with many griefs,” as I Timothy 6 says of those too “eager for money;” and do end up worse off than before. I Timothy 6:9 — Those who want to get rich fall into temptation and a trap and into many foolish and harmful desires that plunge people into ruin and destruction.